"About 1,200 Lebanese, mostly civilians, and 160 Israelis, mostly soldiers, were killed in the conflict." It avoids the usual fog of "the conflict which killed more than 1,000 people". It highlights the asymmetry of the conflict in two ways: many, many more Lebanese died than Israelis. And most Israelis who died were militants, and most Lebanese who died were innocents. The past seven days in Syria really could have taken place in 1987, not 2007. If two events show us that nothing has changed, it is the parliamentary elections, and the sentencing of human rights campaigner Anwar Al-Bunni. The embarrassing contrast of Syria's polls taking place on the same day that France voted for its new president wasn't lost on many observers outside the country. One point kept being repeated: part of parliament is 'reserved' for the Baath. Yes, there are many independents, who do fight a genuine campaign, and who won dozens of seats. But Syria is no France. The focus on Syria feels like it has more than a tinge of hypocricy. 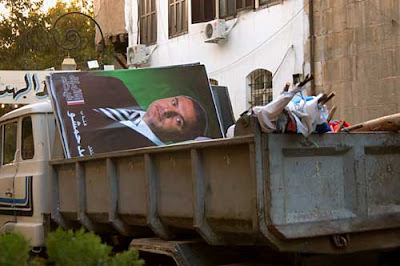 Hariri bought off opponents in Beirut - so that almost all of the capital's voters had just one choice on their ballot paper: a Hariri candidate. And what of the Gulf states, where until recently women's voice was surpressed. Or Egypt, where anti-Mubarak bloggers are detained and raped by police, and where politicians are jailed en-mass (Ayman Nour and the Muslim Brotherhood). Or Saudi Arabia, where no-one votes. Should any of this come as a surprise? Did we really expect a change since the last elections in 2003? There hasn't been any pretence of political reform. How can we complain that there hasn't been enough movement, and then act surprised when we realise we're still standing in the same place? The election period has just drawn attention to that stagnation. And it takes the focus away from the very real economic progress. Growth has gone above 5%, the World Economic Forum praised Syria's improvements on rooting out corruption - one year after an anti-corruption drive was launched, and foreign private banks have sprung up. Tourist developments are underway across the country, funded by Saudi and Qatari money. It's part of Syria's aim to attract 7 million tourists into the country, to fill the gap left by the dwindling oil reserves. Seven years ago, few believed much would change in Syria's economy. Not enough has happened, but there has been just enough to surprise us all. Maybe we shouldn't be so dismissive of the promised political reform. And now, Abdullah Al-Dardari - the former UN economist who came back to Syria to head up the economic reform - looks set to be announced as the country's new Prime Minister. That would really show how much of a priority economic reform is. 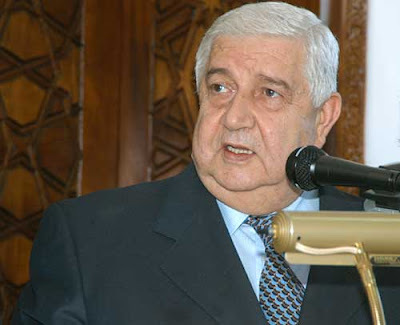 It would also signal a significant political shift: Al-Dardari is a non-Baathist. The self-inflicted pain wasn't limited to the elections, though. Human rights campaigner Anwar Al-Bunni has been given five years in jail. I didn't agree with much of what he said - especially what appeared to be his support for Farid Ghadhry, who advocates a US military invasion of Syria. But I agree with his right to say it. Syria's opposition is what makes this country strong. I believe that whatever our political opinions, we will all suffer if there is a lack of debate. Bunni's voice is vital. Over the past few years, the trend has been towards releasing political prisoners, and makes Bunni's treatment even more shocking - many were expecting him to be released, not sentenced. Other human rights campaigners claim Syria has no more than a few dozen political prisoners left in jail (excluding the Muslim Brotherhood). Amnesty International puts the figure at around 600 (including the MB). Of course, there have been arrests and subsequent quick releases - the reveolving door. In most cases, people are held for a matter of weeks or months, and we can only hope Bunni will be face a similar fate and be out by the summer. No such chance for a rebirth of the Sandmonkey. One of Egypt's most outspoken bloggers has signed off for the final time. The neo-con made many enemies, but no-one, it seems, can compete with the might of the Big Enemy. We have to hope a similar fate never befalls Syria's blogosphere. It remains a strong and independent voice amid the turmoil and despair. While the rest of the world was waiting for the results of France's elections, Al Jazeera devoted thirty-minutes to Syria's vote. At least fifteen people have been killed, and many more injured in a major road accident on the main highway to Iraq. It happened when a speeding truck crashed into a total of eighteen other vehicles. The cars were travelling slowly through a sandstorm, and that may have contributed to the lack of visibility. All of the victims burned to death. It happened on the desert highway, and ambulances and fire crews had to travel 200 kilometers from Damascus. It is thought that delay added to the death toll. One of the firefighters said it was the worst catastrophe he had seen in his career. I'm sleeping, don't wake me up. "There was little drama about the outcome. Pre-election horse-trading and backroom alliances meant that nine of the 19 seats were uncontested, and there was little real opposition ... for control of the rest. Outside polling stations, voters were handed small squares of paper with [a] political list written on them, making voting as easy as stuffing the pre-printed ballots into brown envelopes ready for the ballot box." Some of the delicious Al Jazeera English programmes now have their own dedicated page on YouTube. It means you can watch some of AJE's fantastic feature programming just a day or two after transmission. Right now, the Fabulous Picture Show (Amanda Palmer's alternative movie programme, made at London's beautiful Everyman Cinema Club, at the top of Hampstead hill) is up. So is travel guide '48' (where the same Amanda Palmer spends forty-eight hours in one city, visiting the parts few tourists get to see - her first one was in Damascus, it is well worth a watch ... Part 1 and Part 2). FPS and 48 represent everything AJE stands for: wonderfully shot, diverse content. I hope they never give up features to make more room for rolling news. Other shows worth checking out are the Listening Post, a sideways look at how the world's media deals with the stories of the week. Watching them watching us. Then there's Rageh Omaar's independent documentary strand Witness. And Everywoman meets women in religion, society, politics, education and the arts. People and Power deals with the stuggle of the individual, and civil society against ingrained authority (yesterday, there was a report on the ENA, France's 'political school' where 7 out of the last 10 prime ministers have come from - the argument: politics won't change even if the parties change, because they all have an 'ENA' way of thinking). Star appointments David Frost and Riz Khan also have their slots. They're joined by Inside Iran, 101 East (on the Asia Pacific). Well worth a watch. And if it's news you're after, you can watch Al Jazeera live here. No, there's no professional bias in this post whatsoever. I don't know what you're talking about! Honest. An Israeli Minister says his country is ready to start negotiating with Syria. Syria has repeatedly offered talks with Israel over the past seven years, but Israel has ignored every call. When US Speaker Nancy Pelosi visited Damascus and announced that Israel and Syria were ready to start peace talks, she was rebuked by Israel. Now, it seems, things have changed. Israel's Minister for Immigration and Absorption Ze’ev Boim said that Israel is ready to start talks, and it seems he has dropped Israel's preconditions that Syria end support for what it calls terrorism (Hamas and Hizbollah). Instead, Boim only says that it would be useful if Syria didn't support Hizbollah: "In order to ensure a positive outcome of the talks with Israel, President Bashar al-Assad should stop arming Hezbollah, close HAMAS and Islamic Jihad headquarters in Damascus". It is not clear whether his statement was a slip of the tongue, or whether he actually represents Prime Minister Ehud Olmert's views. Last year, Israel's Defence Minister and Foreign Minister publicly called for talks with Syria - Olmert said no. Why is this not called 'terrorism'? The World Economic Forum has analysed Syria's economy for the first time, and praised it for having low corruption. It also says Syria's economic infrastructure is efficient - with the exception of the airports and sea ports. The health care and education systems also come in for praise, where progress has been made. Syria is ranked 12 in the world for its competitiveness (compared to other countries at the same level of development). Egypt, Morocco, Oman and Tunisia were the only Arab countries to get a higher place in the table. Syria's economy has been the focus of liberalisation efforts in the past seven years, as political reforms have stalled. 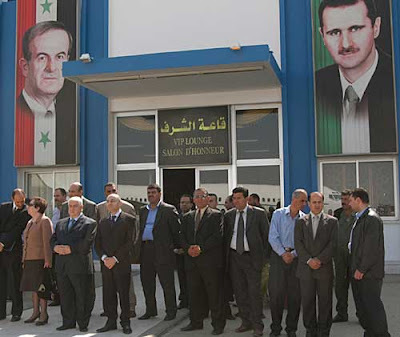 Bashar launched an anti-corruption drive months ago, which many laughed at. It seems to have paid dividends. 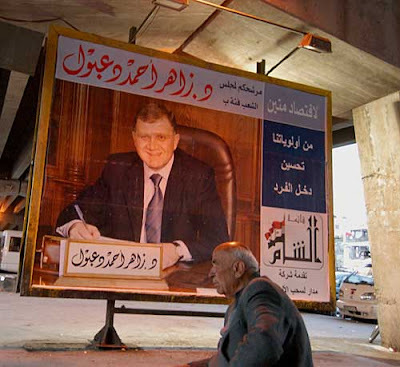 Earlier in his presidency, Deputy Prime Minister (and former World Bank official) Abdullah Dardari - seen as one of the country's rising stars - opened the country's economy up, creating a stock market, and allowing foreign private banks in for the first time. The World Economic Forum did criticise Syria for the size of its budget defecit (it is spending more than it earns - mainly on a huge public sector, with far too many employees) and the size of its public debt (to fund that defecit). They advise" "comprehensive liberalization of foreign trade and labour markets, facilitating access to finance for business as well as fostering the use of latest technologies". It was the first time the WEF studied Syria. The United Arab Emirates was rated as the Arab World's most competitive economy - last year Qatar took that title. ...and why Syria isn't part of it. The Allepine Elephant stomps all over ignorance once again. Bush has never said Syria is part of the Axis of Evil, neither have any of his spokesmen. So who's making the mistake? Essential reading for the terminologically challenged. 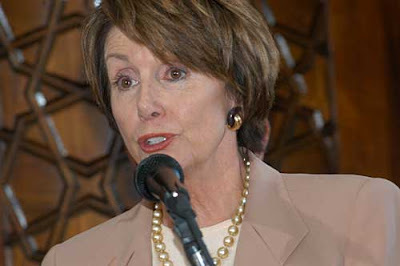 Nancy Pelosi, the third most powerful US politician is in Damascus. But she's already been rebuked by Israel for telling Syria Israel was ready for talks. "(Our) meeting with the (Syrian) president enabled us to communicate a message from prime minister Olmert that Israel was ready to engage in peace talks as well," she said. The Israel government is angry that she said that whole sentence without mentioning the compulsory words "terror" and "support". These words are issued on cards to every US politician who has to speak to the media. Excellent pictures from Nancy Pelosi's meeting with Foreign Minister Walid Mouallim in Damascus yesterday. Many thanks for the photos from Syria's best photographer, John Wreford. Blair thanks friends and allies "in the region"
British Prime Minister Tony Blair has spoken for the first time about Iran's release of the 15 sailors and marines. He has thanked "friends and allies in the region". The only country in the region that helped was Syria (Turkey offered but it didn't happen). The BBC is interpreting that this was a coded way for Blair to thank Syria. And it also says something very big: Syria now seems to be considered a "friend" of Britain. It comes as Nancy Pelosi, the third most senior politician in the US, continues her holiday in Syria. She spent the night in Damascus, walking through the Old City talking to shopkeepers and visiting the Ummayid Mosque. Not since Bashar visited Blair in London in December 2002 have relations been so good. Despite earlier Iranian denials, it has been revealed that Syria mediated between Britain and Iran. And it worked. Iran has released the 15 UK sailors and marines. Playing a very clever game here. Syria has offered to mediate in the Iran-UK dispute. Iran is holding 15 British sailors and marines which it accuses of tresspassing into Iranian waters. The UK denies this and has refused to apologise. Syria - which has excellent contacts inside Iran and reasonable relations with Britain - has offered to mediate. Iran has refused, saying it is a bilateral issue, and the UK knows what it has to do (sound familiar Bush?). Nancy Pelosi, the leader of the House in Washington, and the most senior Democrat, is in Syria. Yesterday she was welcomed by Foreign Minister Walid Al-Mouallim. 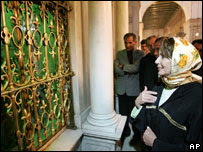 Last night she visited the Ummayid Mosque. You can see her standing in front of the head of John the Baptist - a shrine is built inside the main (Muslim) prayer hall. After that, she walked through the Bazouriyeh market, chatting with stallholders who offered her dried figs and nuts. This is not an arrogant visit to Syria to shout at Bashar, she seems to be showing the American public that she is engaging with the Syrian people, as much she is with the Syrian leadership. It is a very different atmosphere to last month's visit by a Bush government official to talk about the Iraqi refugee crisis. There were no tours of Old Damascus then. This is Pelosi hugging and kissing Syria, almost wanting to apologise for the way her rival, Bush, has treated Syria. It is also a hint that Syria would not be ignored if the Democrats come to power (there are a lot of people who would disagree with that statement - but that seems to be Pelosi's message). Later today she will meet Syria President Bashar Al-Assad. She is expected to tell him Israel's view on the return of the Golan Heights. Last month, the EU's foreign policy chief visited Damascus and publicly supported Syria's right to regain the illegally occupied Golan Heights. Seems almost like a holiday, staying in a luxury Damascene residence - instead of your usual two hour US visits. This is not only the most senior US official to visit Syria for four years - I think it could be the longest visit by a senior US official for many years.